A dull Friday morning. But, of course, to those working a five day week, Friday morning is never dull. It is enriched with the promises of both edible treats to celebrate the working week’s end and, equally, to celebrate the start of the weekend, when all good things in life appear – for a day or two – eminently possible. But, weatherwise, this was a dull morning, with low, dark overcast and no sign at all of the rising sun’s glow. In just over a week’s time we’d be in winter and, meteorologically, this Friday morning was getting all set up for it. And also, for those into consumerism, materialism and our incessant manipulation by the mass media – and also, of course, those who know it as just plain, simple, good old shopping – this was indeed a dark day. Indeed (there’s that word again! ), no day could be darker, for this was Black Friday, when many hope to grab bargains (why does the word “grab” seem particularly appropriate here … ? …) and so accumulate yet more, “happiness inducing stuff”. The more of it we have, the happier we are, right? Anyway, oblivious to all this mass hysteria, I’d had a first breakfast before dawn, and then set off on foot into the dark streets with the little camera in my pocket. And after an hour or so – and seeing that it was a Friday – I dropped gratefully into Deb’s Café & Takeaway and ordered a second breakfast – a thick, “doorstop” bacon sandwich, and a mug of hot, strong, sweet tea – ah, Life’s Simple Pleasures! I’d been into Deb’s before. Indeed I’d been into Deb’s when it was packed out, with no room to sit down, and so been forced to look elsewhere for what the more cultured gourmets of my social circle term “a good plateful”. What’s Deb’s like? Well, its a little street café staffed by women whom I take to be three generations of the same family, it opens at 7am and closes after lunch, and it specialises in good, solid, simple English food, much of it in the full English breakfast vein. So, as I sat there, taken aback somewhat by just how much of a doorstop I’d contracted to get outside of, I looked out at the grey morning and the grey urban landscape. In that moment, what could I see? A woman, head down, trudges through the parked cars towards the at best uninspiring (except for Deb’s!!!) row of shops. Down left of her there is a litter (trash) bin, while the shining metallic semicircles immediately outside of Deb’s are the backs of chairs set around tables, for those who like to smoke while eating. And further away, the suburban landscape: houses, a single decker bus, and bare, pollarded trees. 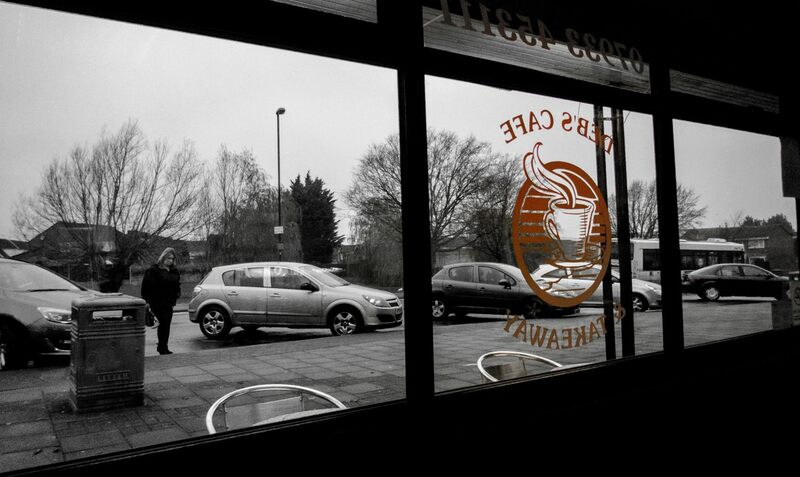 Rather a bleak scene, but one which was amply compensated for by the warmth and conviviality of the café. And, grey and bleak though that view may have been, it was immeasurably enhanced by the absence of any hint of the burgeoning greed and materialism of Black Friday. I downed the doorstop with lashings of ketchup, drank the delicious tea, struggled to my feet, made it to the door, and lurched off, heavily and uncertainly, into the gloom. The first image in the Outer Suburbs series, with context, is here: 1 . Subsequent images are here: 2 3 4 5 6 7 8 9 10 11 12 13 14 15 16 17 18 19 20 21 22 23 24 25 26 27 28 29 30 31 32 33 34 35 36 37 38 39 40 . Each will open in a separate window. Technique: TG-5 at 25mm (equiv); 1,000 ISO; Lightroom, using the Camera Vivid film simulation; Silver Efex Pro 2, starting at the Full Spectrum Inverse preset and selectively restoring some of the colour; south Bristol; 23 Nov 2018. I like your description of the working person’s Friday, when all things seem possible. 🙂 I’m glad you’re oblivious to the mad pursuits of Black Friday, and glad too that you introduced us to the “doorstop” sandwich – wow. I like the selective color here – it works well. As much as i love great espresso and well made croissants, I am completely with you when it comes to the pleasures of partaking in anything down-to-earth and without hype. Lurching off into the gloom! Adrian, you’re having fun, thanks for inviting us along! You made me smile too. I very much enjoyed seeing and reading this one. Cheers. Of course the name of the album also celebrates the name of the final edition of the local newspapers which in most town no longer exist. I have memories of street newspaper sellers shouting “final” as they tried to shift their last few copies before heading home. I’m not one for nostalgia for nostalgia sake but the more traditional style of British cafes where once the only coffee on sale was coffee (not a matt-flat-white-withsprinkles-togo) and the only tea was tea are in decline. It wasn’t just about simple tea and coffee but something more honest. Things weren’t dressed up to add value! That is of course in business terms ‘charge as much as possible for as little as possible’! Someone visiting Sheffield a few weeks ago stopped me in the street and asked where they could get a greasy full English breakfast. Clearly they didn’t want a Costa or Starbucks and then I really struggled to think where in the centre of Sheffield they might find a cafe with such fare on offer. I managed to make a recommendation but I really had to think! Sharon’s in the old Castle Market closed when the whole place was set for demolition. They moved some of the eateries to a new covered market but placed them all together in one big eating area so any atmosphere of the old market has been completely erased. The food may not have changed but eating in a cafe is also about atmosphere, banter, and a sense of identity.